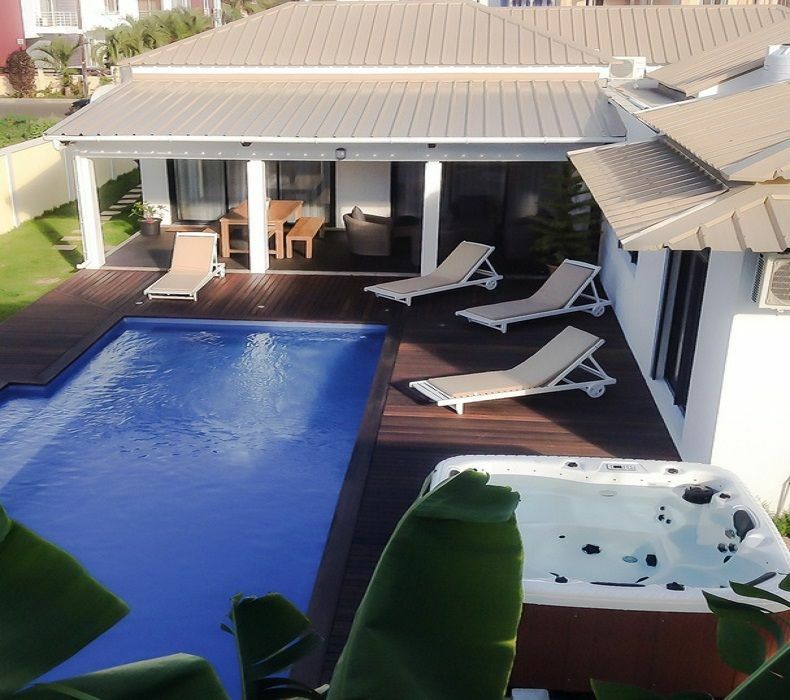 (Text automatically translated) Recently built in Flic-en-Flac (west coast of the island), Villa "blue Azur" will offer privacy, comfort and lifestyle in Mauritius during your stay. The villa can accommodate 6 people bring you all the comfort and privacy of your dreams for your holiday. The villa "Azure" is fully equipped with private pool and Jacuzzi, kitchen, living room, dining room, TV Satellite, air conditioning, porches, gazebo, parking, concierge, possibility cooked meals for staff, BBQ, local cuisine. etc. .. ... close to all amenities (bank, casino, post office, supermarket, shops ... The beautiful beach in Flic-en-Flac is located 200 meters from the residence. Zunächst ist man erstaunt, dass Kameras und Zäune am Haus sind. Die Bilder des Hauses entsprachen nicht ganz der Realität aber das Paradies entschädigt alles. Man benötigt 2 Tage um in dieser Welt von reizenden, freundlichen Menschen anzukommen. Man lässt lieber Kochen, weil das Küchenequipment nicht so toll ist, jedoch die Küche der Köchin ist sehr gut. (Text automatically translated) Resort of Flic en Flac in the west of the island ..... one of the most beautiful beaches on the island .... and certainly the largest, ideal for walking or jogging! (Text automatically translated) Our residence offers the possibility to stay half board and also offers transfer from the airport to the villa. Excursions can also be proposed as the vehicle locartion avce or without driver.